QR Code Generator | Let's move to 2D! Latest Version: 1.22 Released on Apr 27 2015. QR Code Generator is designed to generate QR code (Quick Response Code) image easily. Nowadays QR code (Quick Response) or two-dimensional barcode typically used in smartphone world and widely used in the industry. Smartphones always contains a camera modul with special scanner software to recognize QR codes, so a QR code is readable for this devices. QR code allows to encode with a few type of error correction algorithm, more than four-thousand characters in one two-dimensional image. The word "QR Code" is a registered trademark of Denso Wave Incorporated. Firstly enter or paste any text into Data field, such as simple text data, sms message, email address, personal contact data, phone number, etc. If necessary can use an online URL shortener service for encode URLs. After setting QR image size, select the proper error-correction level and finally click on "Generate QR Code" button. The generating process is light-fast speed, after a few miliseconds the QR code is displaying. Now the image can save to the disk or can copy into system clipboard for using later with other image processing software. If need more help, just click on Video Tutorial on the right side panel to see how this free QR Code Generator works! Released on: Apr 27 2015. 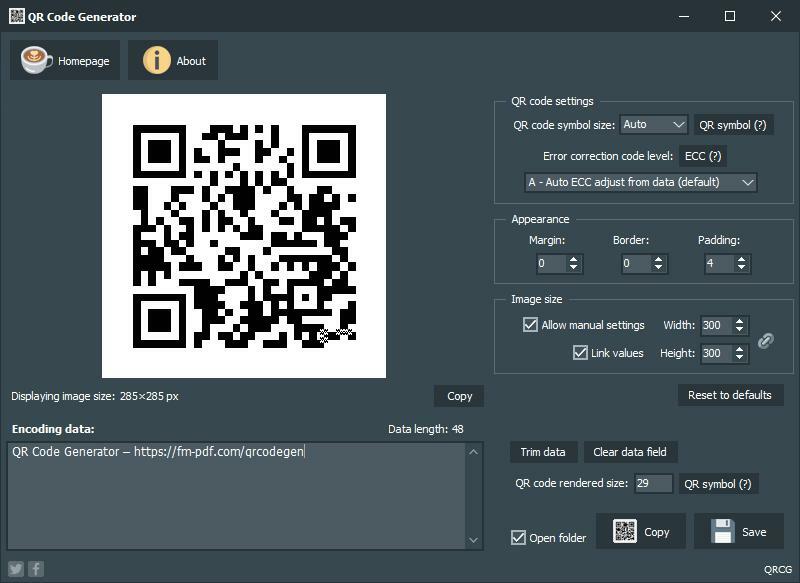 This free image creator is a desktop software can generate and save QR code (Quick Response Code) in other words 2D barcode in PNG image format. If PNG format is not suitable then can use the clipboard support. 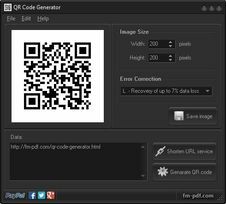 To generate QR code easier than ever before with QR Code Generator. Usually smartphones are using these QR codes for simple text as data, sending sms message, writing email or browsing an URL. After all settings, with a click displaying the accurate QR code image in main panel. Also this free application delivered a built-in online URL shortener service. An old-school style historical QR code information page.